You block time off on your calendar to workout, but everyone knows “it’s just for your workouts” and schedules meetings during that time anyway. You get the stink eye every time you walk out of the office with your gym bag. Performance is measured by time or billable hours and there’s tremendous pressure to dedicate every minute to meeting and exceeding quotas. You travel a lot for work. You’re working 50-60 hours each week in addition to being a parent and spouse. Look around your office right now: (seriously, pop your head up) 7 of 10 people you see are either not engaged with their work or are actively disengaged (Gallup). They’re going through the motions just to get through the day. Only 3 of 10 people are crankin’ it out and doing everything they can to move the success of the company forward. Staggering. More than 1/3 are under stress due to heavy workload, long hours, unrealistic expectations and lack of opportunities for advancement. Which category are you in? Clearly, many corporate environments are not conducive for long-term, sustainable performance. Performance often comes at a high cost to people’s resiliency, stress, health and personal lives. Many of my executive coaching clients share horror stories about the toxicity of their work environments. Research done by the Human Performance Institute, a company I’m a consultant for, found that when employees physically move at regular intervals throughout the day – as little as 1-2 minutes at a time, at least once every 30 minutes – they can “reset” themselves so that they feel less stressed and more energized, mentally focused, emotionally connected with others and engaged in their work, and more aligned with the organization’s mission. In a pilot program using these strategies at New Balance, 82% of employees reported increased energy levels and an enhanced ability to focus. Dr. John Ratey’s work shows that when the body starts to move, the brain lights up in almost every area and results in improved cognition, creativity and problem solving. Yet many of us sit for extended periods of time at our desks, in meetings or driving to sales calls because the perception is that it’s the most productive way to work. You’ve got to put in face time or else you’re a slacker. There are things within our environments that we can’t change, but there are many, many things we can take personal responsibility for. We can do the best we can with the circumstances we find ourselves in. We can choose to move our bodies regularly. We can choose to bring healthy food for meals and snacks. We can choose how we respond in the face of stress. Before I share some helpful strategies, I’d like to hear from you. What’s the environment like where you work? 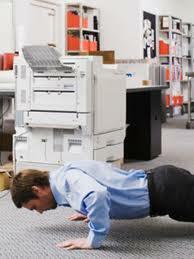 Do you feel comfortable exercising during the work day? How do you creatively integrate movement, exercise and healthy eating into your day? Challenge 1: You feel like you’re getting the stink eye from everyone in the office when you walk out with your gym bag. Do your co-workers realize they benefit from your exercising almost as much as you do? When you exercise you have better energy, manage stress more effectively, and your cognitive function improves. This makes you a more productive worker and easier to be around. As long as you shower afterward. Having a conversation with your boss or co-workers about why exercise is critical for you is important as well. Let them know it makes you a better person all around – to your co-workers, your family and yourself – and saves the company money as you’re healthier and more productive. As long as you’re getting your work done and taking the time from your lunch break there is NO REASON why you can’t spend that time any way you want to. You may also want to check your own perceptions. Are they really giving you the stink eye or could it be envy or jealousy? Staying committed to yourself is a challenging commitment and perhaps they are wishing they had half the discipline you do. Challenge 2: You don’t have time to exercise. No worries! Accumulate movement throughout the day by taking the stairs, standing in meetings, or getting out of your chair while on the phone. Every 2 hours take 5 minutes to do as many flights of stairs as you can. Drink a ton of water so you have to go to the bathroom frequently. (They’re really not going to stop you from doing that, are they?) I have no association with this product, but Fitbit is a fantastic way to monitor movement throughout the day. Just clip it on and it keeps track of steps taken, calories burned, stairs climbed, and even your sleep. It downloads data to your computer and gives you a full summary of each day complete with graphs, pie charts and other sorts of nerdy goodness. Make a goal to increase your level of movement each day. Also, stop telling yourself a workout has to be an hour, 45 minutes or even 30 minutes. If you’re really focused and give it all you’ve got, you can get a lot of exercise done in 15-20 minutes. Which is better than 0 minutes. Break it up if you need to! Wake up a few minutes early and do push ups, sit ups, squats, lunges and burpees. After dinner take a few minutes to walk, jog or run around your neighborhood. It all adds up. Challenge 3: It’s too difficult to eat healthy and besides, I don’t have time. I’m often surprised by the number of executives that tell me they don’t have time to pack a lunch or snack, but when I ask if they have kids and do they make them a lunch to take to school the answer is almost always “yes”. If you’re making lunches for anyone in your family, why not make one for yourself while you’re at it? Most of us put leftovers into the refrigerator each night. 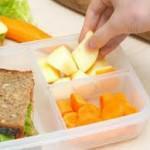 If you’re putting food into containers, why not put some into containers you can take to work? It takes 4 minutes to make a sandwich at home. It takes 10 seconds to put a banana or container of yogurt in your bag. How long does it take you to walk down to the cafeteria to get some lunch or drive to the closest fast food restaurant? Challenge 4: You travel a lot for work. Maybe the hotel you’re staying at doesn’t have a gym or you don’t feel like going. Perhaps there wasn’t room for sneakers in your suitcase. I travel extensively for work which is one of the reasons I designed Hit the Deck™: I want to keep up with my exercise routine when I travel, but don’t want to pack a lot of extra gear or for the workout to take too much time. With Hit the Deck™ you can get your cardiovascular and resistance training done at the same time with no equipment, and you can do it in the convenience of your hotel room. There are 3 different intensities you can work from and with over 30 cards to choose from your workout may never be the same twice. I’d love to know about your challenges and how you overcome them – please share what you’ve learned! Ladies, Hard Work Will Not Get You To the Top. Three Ways to Stop Working Harder and Start Working Smarter.